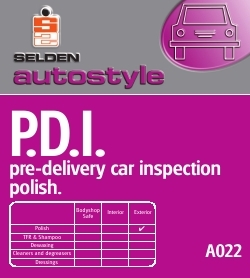 A premium quality wax polish specially formulated for P.D.I. Produces a deep, even lustre, even on dark problem colours. Removes any traces of factory soft wax which might be left after the dewaxing operation. Developed for ease of use, quickly on - quickly off. Removes petrol, derv and exhaust stains from paintwork. Contains silicones. Premium quality polish enriched with a blend of polymers and waxes, including carnuba. Specially formulated for P.D.I. where a superb showroom finish is required. Shake container before use. Vehicle should be clean and dry. Apply polish with a soft lint free cloth. Polish off with a clean, soft, dry cloth. Always replace cap. STORAGE: Do not store in temperatures greater than 35°C or less than 0°C. Store away from foodstuffs. Do not transfer into another container. SPILLAGE: Contain spillage and soak up in absorbent non-flammable material such as dry sand or earth.